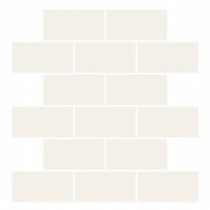 Buy online Rittenhouse Square White 12 in. x 12 in. x 8 mm Ceramic Mosaic Tile 010024BWHD1P2 and leave review or share with Your friends. The Daltile Semi-Gloss White 12 in. x 12 in. Ceramic Mosaic Tile has a striking, medium-gloss surface. Its tasteful, soothing color coordinates easily with almost any room's decor. You can use this tile on a wall, kitchen backsplash or countertop. The versatile tile can be used to create a memorable tile design. 0.833 square foot per piece, each piece sold individually. Piece weight equals 2.22 lb.